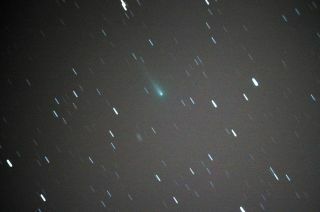 Astrophotographer Charles Prince sent in a photo of Comet ISON taken from his home observatory, Chuckwalla Observatory, in the Mojave Desert of California. Photo taken October 5, 2013. The fall night sky in the Northern Hemisphere brings a veritable harvest of amazing celestial sights and this year is no different, but you do need to know when to look up to see them. A lot is happening in the night sky between now and the winter solstice on Dec. 21. Between now and then, northern stargazers will see two eclipses (one lunar, one solar), four meteor showers, the brightest planet in the solar system reaching its pinnacle in brilliance and a potential bright comet. As the northern fall shifts into full gear, here's a closer look at each of these uspcoming events. Friday/Saturday, Oct. 18/19, 2:25–4:37 a.m. EDT. The Moon will pass through the edge (penumbra) of the Earth’s shadow just after moonrise on the East Coast of North America. This eclipse is very slight, so you will have to look closely so as not to miss it. Look for a shading on the lower half of the Full Moon. It will also be visible in Africa, Europe, and the Middle East. This is a rather unusual solar eclipse in that along the eclipse track, which runs for more than 8,300 miles (13,360 kilometers) across the Earth's surface, the eclipse quickly morphs from annular to a total eclipse; known to astronomers as a "hybrid eclipse." Truth be told, along most of the track the eclipse appears as a total, with a very thin annulus/ring of sunlight being seen near the very beginning of the track. The track of the central line of this eclipse begins over the Atlantic Ocean about 440 miles (700 km) southeast of the Carolinas. So along North America's Atlantic Coast, interested viewers on this first Sunday of November (using proper viewing devices, such as pinhole projection or #14 welders glass) will only see the dark disk of the moon exiting the sun's face at sunrise. The eclipse track will pass south of the Cape Verde Islands, then curve southeastward parallel to the African coastline. Greatest eclipse with 100 seconds of totality and the path width reaching a maximum of just 36 miles (58 km) occurs approximately 250 miles (400 km) off the coast of Liberia. The shadow track will then sweep across central Africa, passing over sections of Gabon, Congo, the Democratic Republic of the Congo, Uganda and Kenya, before ending at sunset at the Ethiopia-Somalia border. Astrophotographer Jason Hullinger took this long exposure of star trails and Orionid meteors Red Canyon State Park, CA near Mojave/California City on Oct. 21. 2012. For about two weeks, conditions will be very favorable for observing the weak, long-lasting Taurid meteor shower, which should peak about Nov. 8, five days after new moon. Observers with clear, dark skies can then expect to see anywhere from about eight to 10 Taurids each hour throughout early and mid-November with perhaps as many as a dozen or so per hour on the peak night. On the date of maximum activity, the radiant (midway between the V-shaped Hyades star cluster and the famous Pleiades) will be highest in the southern sky at around 1 a.m. your local time. The Taurids are unusual in that as many meteors can be seen in the evening as in the morning, since the shower’s radiant is fairly high all night. The higher a shower's radiant, the more meteors from it appear everywhere in the sky. This display lasts for at least a couple of Taurids per hour can be seen from Oct. 20 to Nov. 30. Lastly, the Taurids are debris from Periodic Comet Encke. They are the slowest of any major meteor showers, encountering the Earth at only 17 miles/second (28 km/s). As a result, the Taurids are sometimes referred to as "The Halloween Fireballs," because they are noted for the many brightly colored meteors. While yellow is the predominant color, many orange, green, red and blue fireballs have been observed. The waxing gibbous moon will unfortunately brighten the sky almost all night and will seriously hamper observations of this year's Geminid meteor shower, which reaches maximum on the night of Dec. 13-14. The emanation point of these meteors, near the bright star Castor in Gemini (hence the name "Geminids") rises from the east-northeast as evening twilight ends; it will be well placed in the northwestern sky when the moon sets on the Dec. 14 at roughly 4:30 a.m. local time and on Dec. 15 at roughly 5:30 a.m. Morning twilight will not interfere until about 6 a.m. During those short periods of darkness, observers with clear dark skies may see perhaps as many as one meteor per minute. Slow-moving fireballs are a feature of this display. This contrast-enhanced, computer-processed image was produced from photos of Comet ISON taken by NASA's Hubble Space Telescope on April 10, 2013, when the comet was 386 million miles from the sun. Comet ISON is ever so slowly brightening as it approaches the sun, but exactly how bright it will get in the days and weeks to come is still very uncertain. However, SPACE.com would strongly warn readers that only experienced observers should attempt observation of ISON as it whips around the sun. Viewing the comet itself poses no danger, but potential danger lies in staring directly at the sun whose infrared rays can burn the retina of the eye without causing any pain. If the comet survives its grazing encounter with the sun, it is hoped the comet will put on its best show in the eastern morning sky, between Dec. 6 and Dec. 15. Wednesday, Oct. 16, after sunset. Look just below Venus for the red giant star Antares. If you look carefully, you may also be able to spot Mercury and Saturn. During December, the dazzling planet Venus will become the showiest it will be for all of 2013 and 2014 in either the evening or the morning sky. It will be so bright that you can spot it in a clear blue sky before sunset — if your eye lands on the right point in the south-southwest. As twilight comes on, Venus appears to grow increasingly large and bright. Venus reaches its highest altitude of the year in early December (for observers at middle northern latitudes) and its greatest brilliancy on Dec. 6. Nonetheless this is not one of Venus' better apparitions. Bright as it is, the planet is only about 20 degrees above the horizon 45 minutes after sunset during the first half of December; you may have to move around to get a view past local obstructions. Earth's "sister" world is nearing the end of one of its low apparitions, and by Christmas it is dropping rapidly into the twilight glow, and, gaining speed it will vanish from the evening sky during the first half of January.